This IHRB occasional paper was written to explore the impacts of big data on fundamental rights, highlight current expert opinion, and provoke deeper discussion and critical assessment of the roles and responsibilities of companies in the collection, storage, processing and sharing of personal data. Businesses have collected and analysed consumer data to reduce costs and increase profits for years. But this established practice has reached an unprecedented sophistication and scale with the introduction of big data. Big data analytics is a tool through which businesses analyse large, complex data sets to identify correlations, produce actionable predictions, and capitalise on the results by trading them as a raw product or service. The sophistication and scale inherent in successful big data analytics has enabled the creation of a whole new industry – that of the data broker – to collect and aggregate vast quantities of personal data. The rise of the data broker business model has made the scale and sophistication of big data analytics so great, and the resulting network so complex, that it is virtually impossible for any consumer to identify how a data broker obtained his or her data. Nor is there a consistent way for consumers to access, correct, or suppress it. At the same time, the current data privacy framework focuses on user consent at the point of collection, rather than data use. This has created a gap in which the data broker business – because they do not collect data directly from a user, and the majority of agreements do not govern downstream uses – is not regulated. The difficulties involved in balancing the risks and benefits posed by big data analytics will affect companies in all sectors, not just technology, because of the growing reliance on business models built around big data. Companies whose business model relies on, or is indeed built around, the insights extracted from personal data, cannot outsource their responsibility to respect human rights to data brokers, and must conduct due human rights diligence as outlined in the UN Guiding Principles on Business and Human Rights. Whether companies are collecting and analysing data themselves or employing the services of a data broker, a strong human rights due diligence process focused on every stage of business operations and business relationships with suppliers and customers would address many of the concerns regarding big data and human rights. 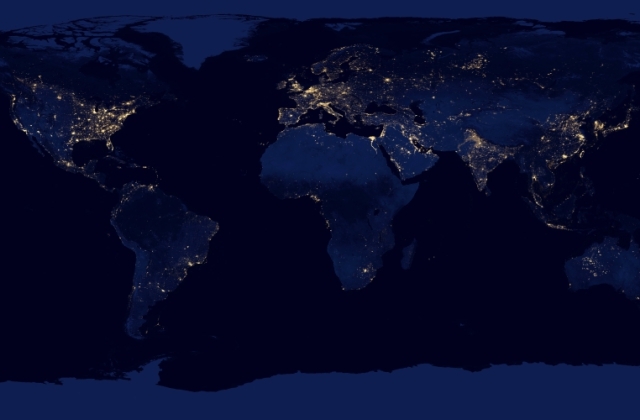 Image: Nasa Earth Observatory, "Earth at night", Flickr/nasamarshall/13230982754.